You are reading this because you're somewhat involved in the demoscene. So, you've probably seen a fractal or 20000. You've no doubt seen mandelbrots, julias, maybe even some others. 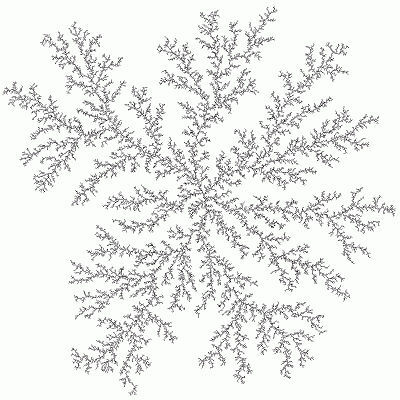 Well, one kind of fractal image is one not seen that often, and is described as Diffusion-Limited Aggregation. Nice big words, eh? Well, DLA isn't really that complicated. 3D DLA featured in YUP's demo "Purple", and also in this article's example, included in the bonus pack with this issue. "Another more colourful description involves a city square surrounded by taverns. Drunks leave the taverns and stagger randomly around the square until they finally trip over one of their insensate companions at which time, lulled by the sounds of peaceful snoring, they lie down and fall asleep. The tendril like structure is an aerial view of the sleeping crowd in the morning." I liked that one a little better, too. :) You should now understand that DLA is called DLA because particles (or drunks) move around randomly (diffusion) until they hit previous particles or the boundaries, where they attach themselves (aggregate) to the overall structure being generated. It's "diffusion-limited" because the final structure is limited by the particle's movement. If you haven't figured it out by now, this method is awefully slow at the grid resolutions it's usually performed in. Aren't we supposed to use this in demos? How is that possible if it's this slow? 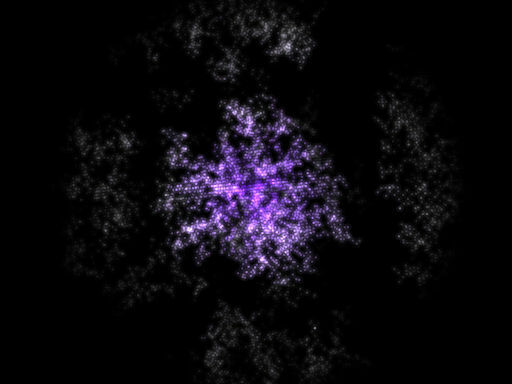 Doing fractals like this is actually pretty easy to do in realtime. I've used the same method for attractors, and I believe Preacher of Traction uses a similar method. How it works is simple: Create some arrays to store colors, coordinates, alpha values, etc, for each particle you want in your simulation (my simulation used 20000 particles). Then, do each particle's calculation in a temporary grid, and when you set its position to true in the grid, store the particle's data in the forementioned arrays. Now, all you have to do in realtime is gradually increase the number of particles that actually get drawn (i.e. frame 1 draws 2 particles, frame 2 draws 4), so it looks like the simulation is being done in realtime, when actually, you're just limiting the particles you draw! Now go read the rest of Hugi 33 ! !